I am judgemental but I don’t preach. 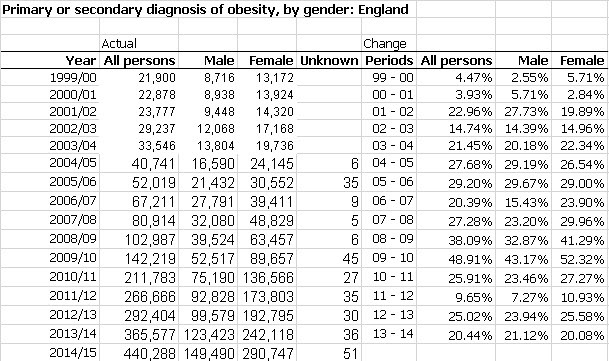 However, as I often do, I was analysing some data and found something I think is shocking: English women are getting fatter than English men and they are ending up in hospital because of it: hundreds of thousands of them. Take a look at the following table and two graphs that I prepared yesterday. The table shows absolute numbers of hospital admissions because of primary or secondary complications because of obesity and it shows the percentage changes from year to year. It’s bad enough that anyone is obese but come on ladies, it’s not a competition to collapse in a heap before your husband! The following table shows the breakdown by age groups and I have shown the percentages for each year as a percentage of total cases for that year. 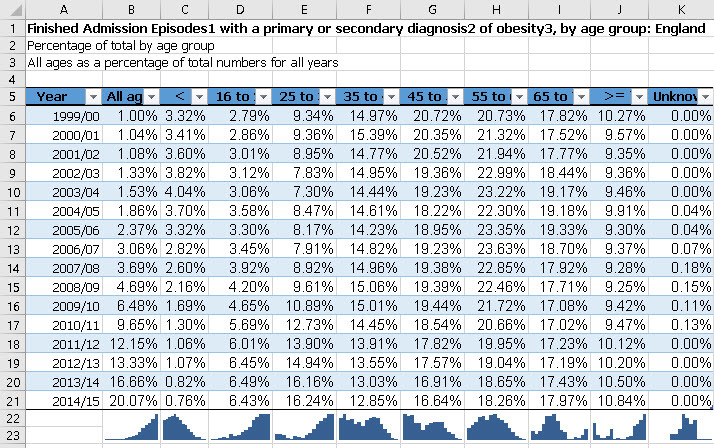 You can see from this second table that obesity becomes a major problem with the 25 – 34 year age group and that problem does not start to go away until the final group, >=75 years. Get out more, eat less: a lot less. By the way, when my son graduated I took him for dinner after his graduation ceremony. We had a normal dinner each. We are both taller than 6 feet so a good dinner for us is a lot for a woman to cope with. However, at the table next to ours were two already very fat young women and their plates, being judgemental as I am, were absolutely stacked with food: Everest proportions but they finished it. Want the file? Ask for it and it’s yours!